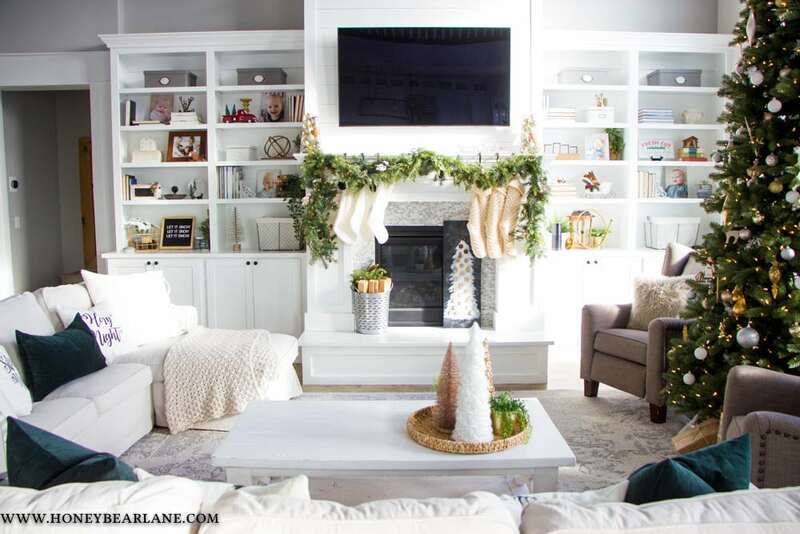 I’m so excited to be participating in Laura’s Meaningful Holiday Home Tour again! I always have to start decorating the week after Halloween because it takes me so long, it’s such a delicate process for me. I am always adjusting and tweaking things to see how I like it better. And each year I end up doing something a little different so I can see what I really do like. And each year I feel like I love it the most! 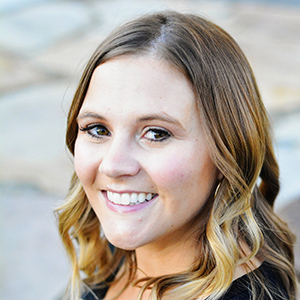 If you’re here from Pink Peppermint Design, welcome! My entry right now is the temporary home of our piano. I moved it out of the front room when I start the big renovation which I started last year and has been put on hold (ya know, pregnancy and baby having and all that) until I get some time. It’s beastly heavy so moving it more than once is really not an option! 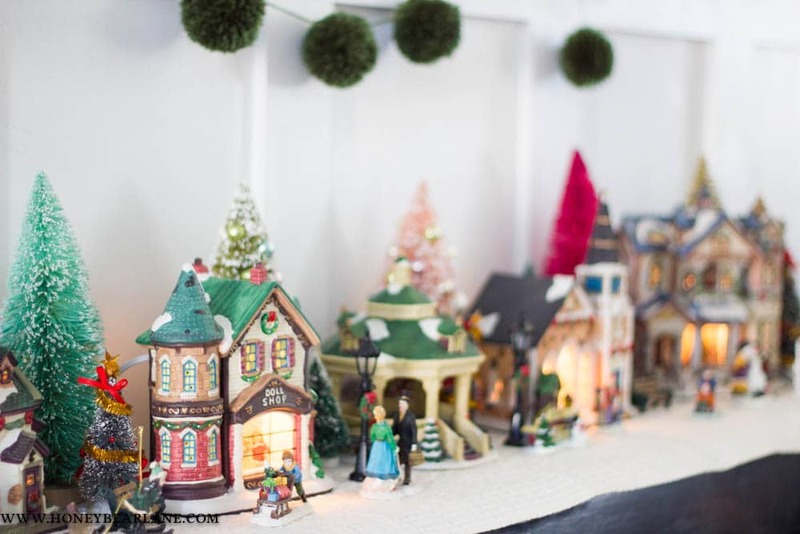 Either way, I still decorated it by putting up my favorite flocked tree and even put out the Christmas village that we have had for awhile but haven’t displayed in a long time. This little village reminds me of my husband because it was always his favorite thing. 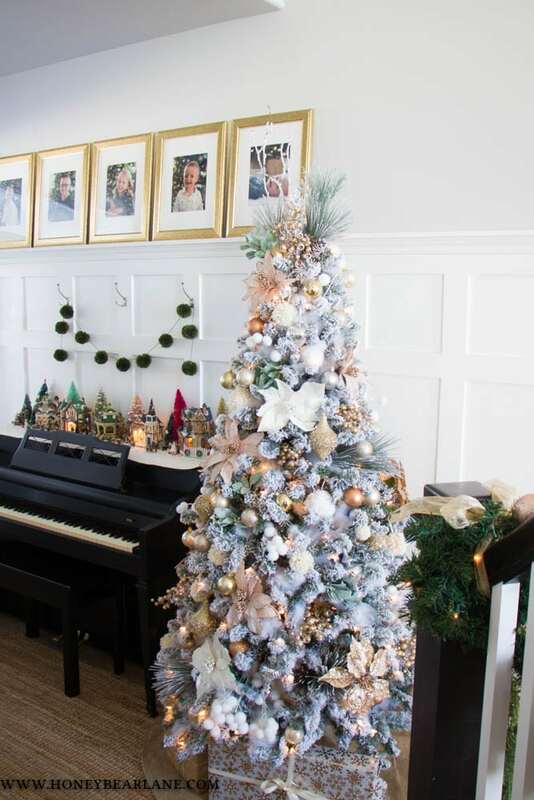 I decorated my flocked tree with shades of white, champagne, and rose gold. And it is just deliciously feminine and beautiful to me. I stuffed it with some faux snow first to give it an extra snowy look. Then I layered in poinsettias of varying colors. My kids helped me decorate because they can’t resist decorating the Christmas tree! I always let them go at it and then adjust it a little. I also love these photos of my kids in front of the Christmas tree. I thought it would be a nice way to personalize this area and I think it would be fun to take them each year and see how they grow. 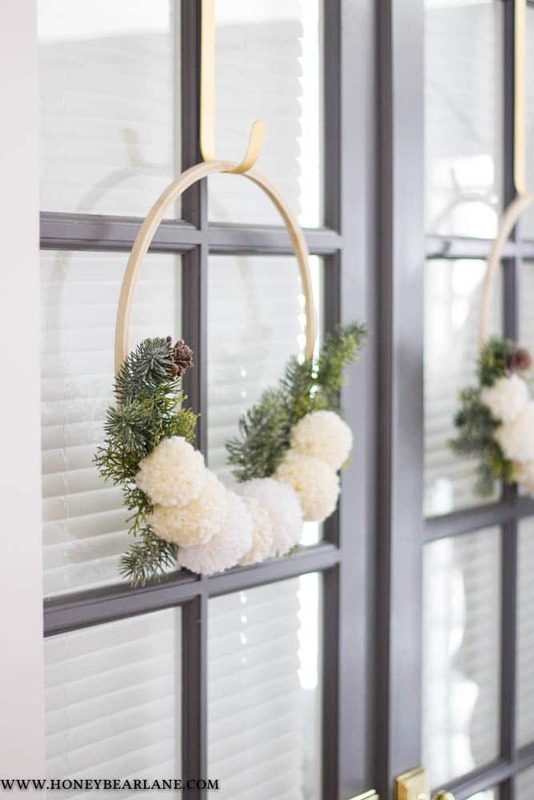 Finally, I am L-O-V-E loving pom poms this year. Can you tell? They are literally everywhere in this entry. 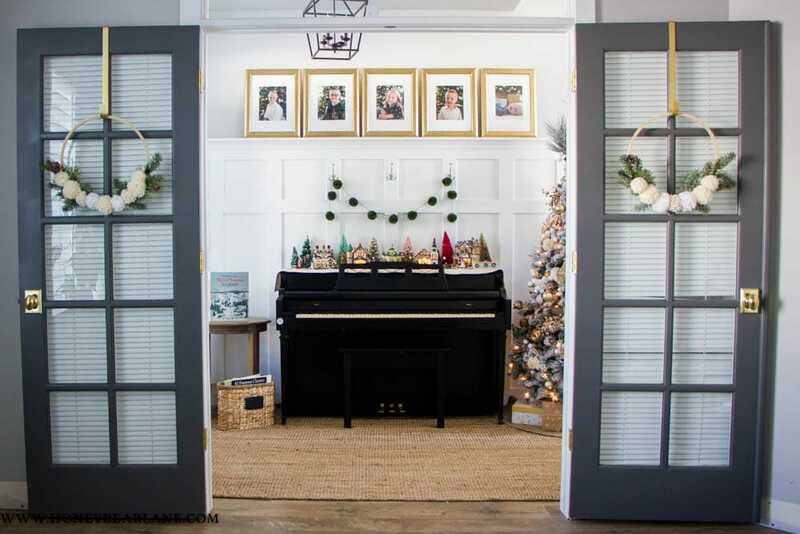 There is the garland above the village, they are on the Christmas tree as ornaments, and I made these cute and simple wreaths for the French doors. I made all the pom poms because they are super easy and fun! To be honest, I really struggle with decorating the kitchen for Christmas! 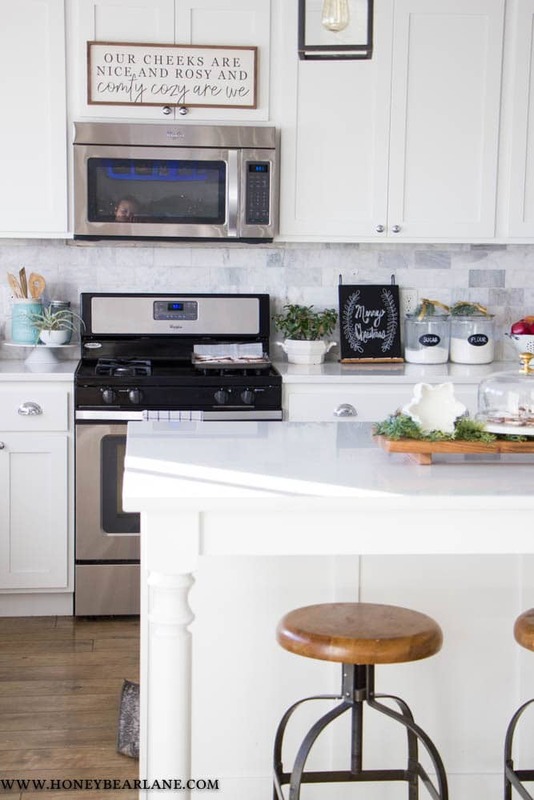 I don’t want to clutter up the counters with decorations and I’m just really at a loss for what to do. I don’t have a stove hood and I don’t want a billion wreaths on each cabinet door. So this year I decided to present myself with the challenge and try to conquer it. I added some greenery here and there, tied some ribbons on the sugar and flour jars, and put my large candles on the windows. But the thing that I’m in love with is this beautiful glass and marble cake plate! I found it at Home Goods and almost didn’t buy it but I’m so glad I did. 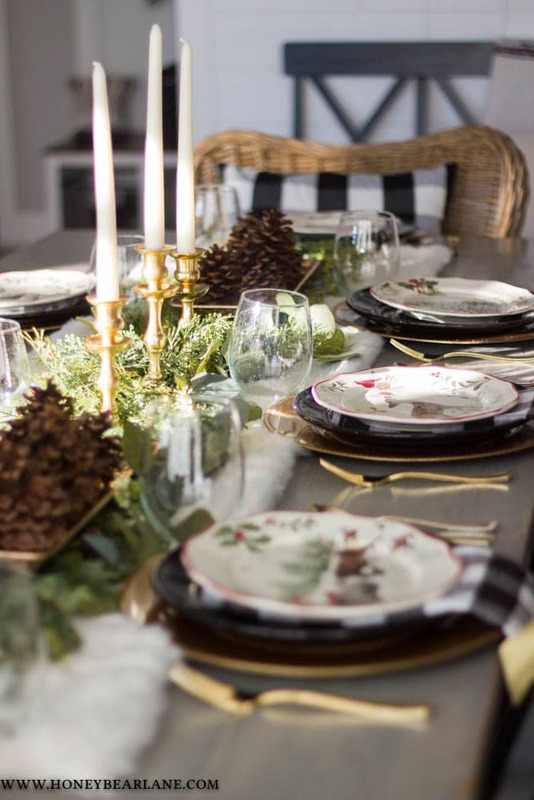 I put it on this pretty wood table and flanked it with some cute snowflake shaped bowls. And my cake plate is the home of some really sweet gingerbread men. My house in the winter is like living on the surface of the sun. Since the sun is lower in the sky, it shines right through all my large south-facing windows and sliding glass door and it’s just SUPER sunny. I actually love all the sunshine but it is actually super hard to photograph the house with the sun streaming in. Especially when it’s snowed and it’s blindingly bright. So I didn’t get the best photos of the dining room which is sad because I love how I set the table! I did my centerpiece from a furry white table runner, greenery on top of that, then some pretty brass candle holders with white candles. 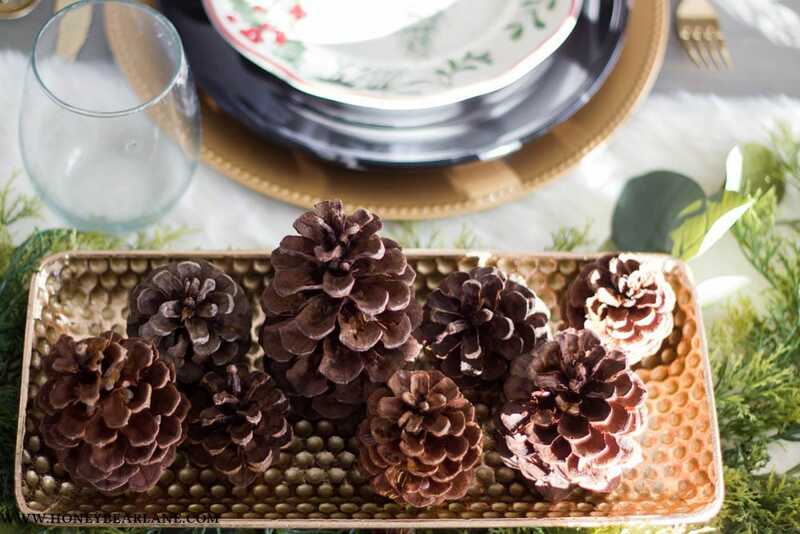 I also found these cool rose gold trays at Hobby Lobby which I filled with some cinnamon pine cones. I did kind of a lot of Christmas crafting this year. 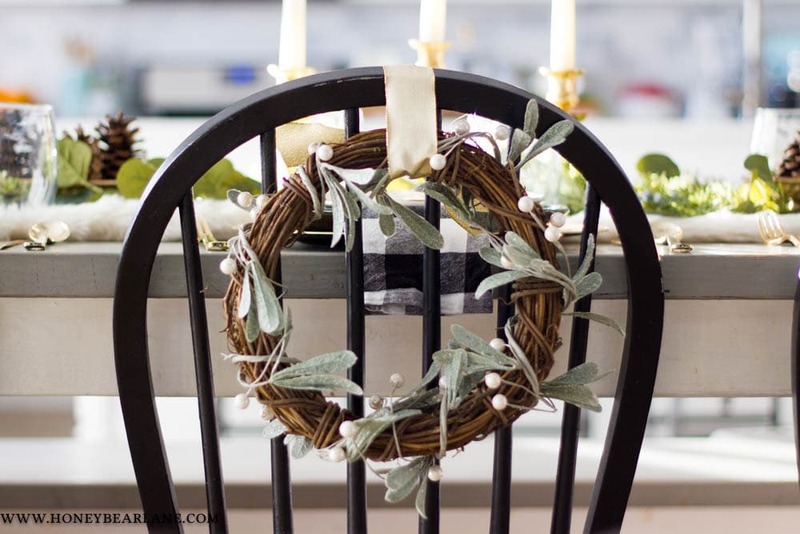 I made the pom pom wreaths, put together the garland, and made these cute and simple grapevine wreaths for the chair backs. Seriously SO easy, I can’t even do a tutorial on it. 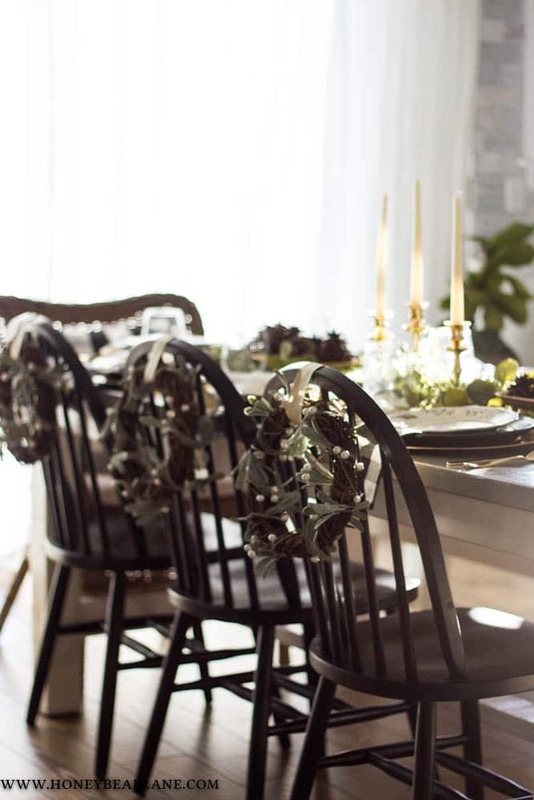 Take a small grapevine wreath and wrap a wired mini-garland around it. Done. 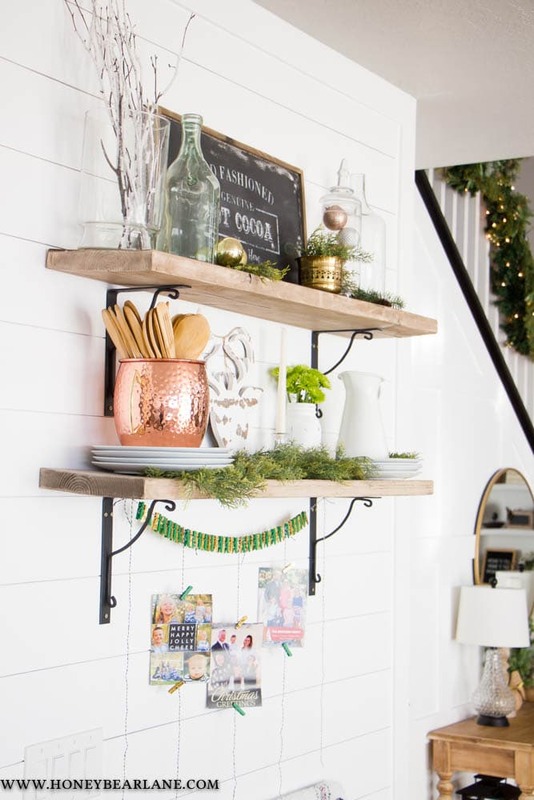 On my dining room wall (in which someday I will have a beautiful buffet cabinet) I have these two shelves which I decorated with some fun kitchen stuff and more greenery. I also tied some butcher’s twine on the brackets in anticipation of the holiday cards. We just use mini clothes line clips to clip the cards up and it’s a fun and easy way to hold all the cards. 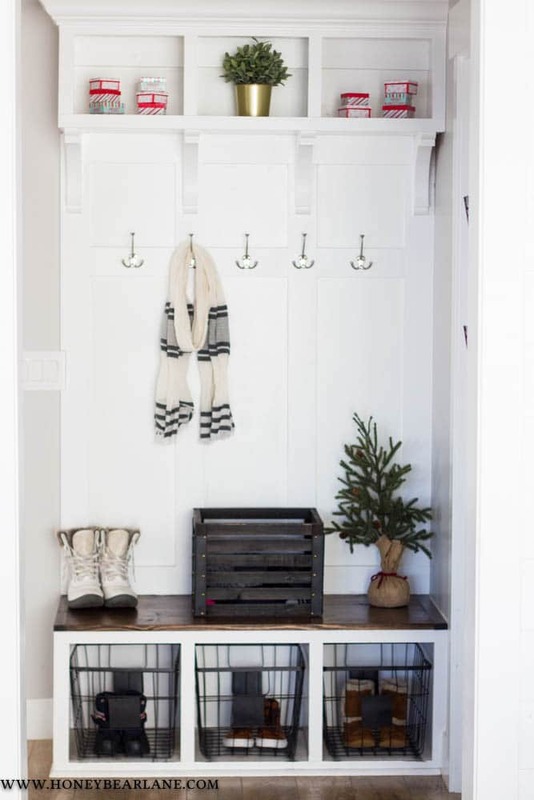 This little space never gets decorated because with 5 kids, it’s definitely more practical than beautiful. It’s usually loaded with shoes and coats and whatnot. But just for today I cleaned it out and took a pretty photo just to share. It’s simple and clean. 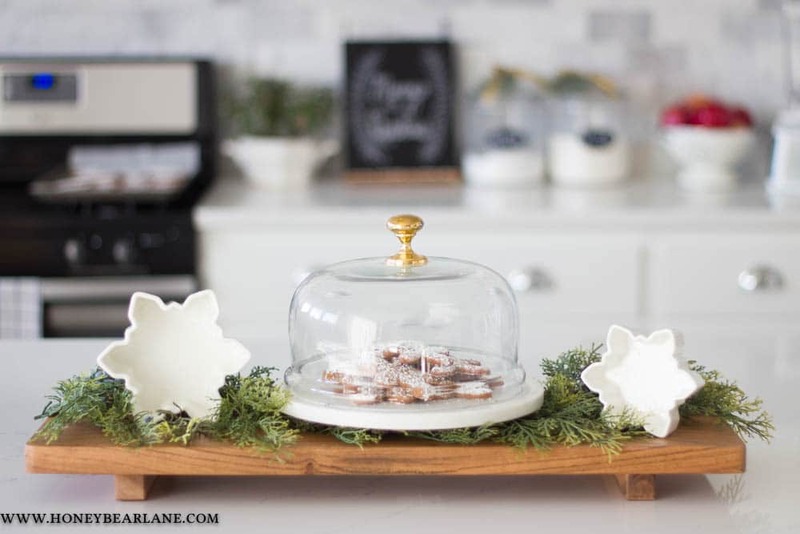 This was the first thing I built in the house…check out the tutorial! I want to say that I keep things simple for Christmas, but this year, I definitely did not. I think it’s because I was pregnant all year and then had a baby and was finally able to feel good enough to start doing stuff like this that it all just burst out of me in the shape of Christmas. The biggest project was the garland on the banister. The banister goes all the way up the stairs and then across the loft. So it’s a big undertaking. 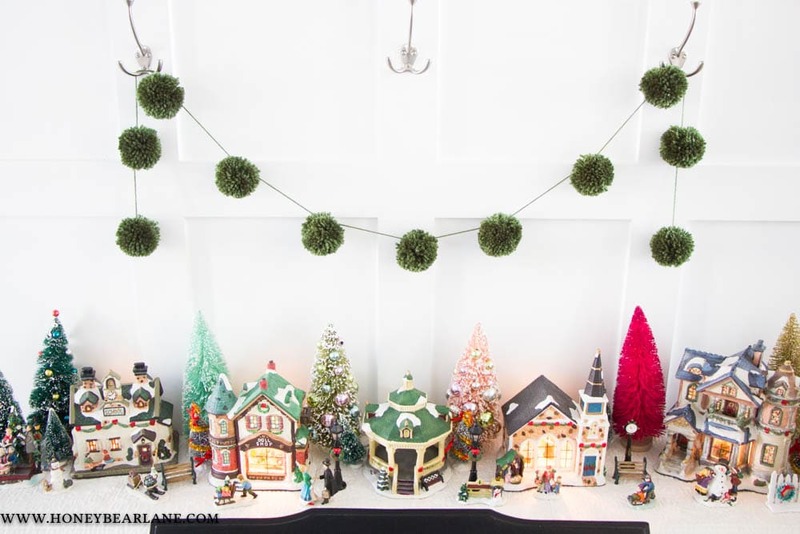 I detailed all about how I got this look (100% fake garland) in this post here. 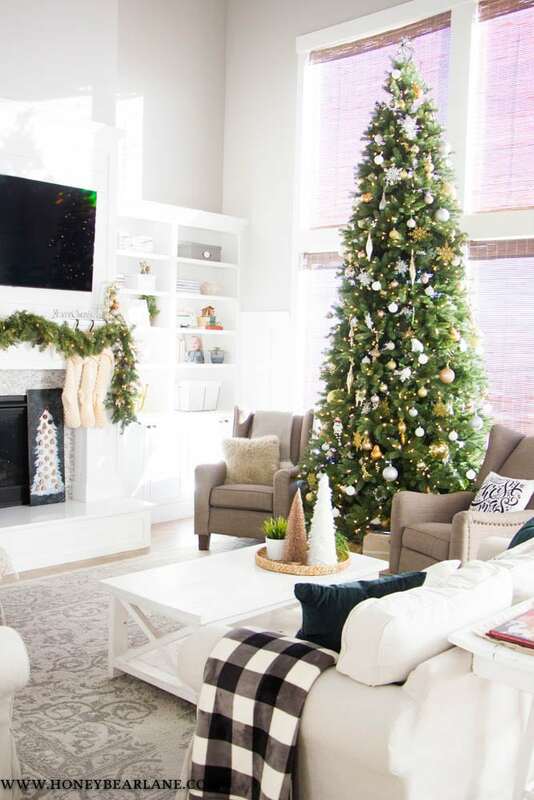 Did you notice that I didn’t use hardly any red in my decorating this year? That’s really unusual for me. I really love red at Christmas but after seeing all the beautiful neutral Christmas schemes on Instagram, I wanted to challenge myself with it. I am over the moon about how it all turned out but I’m not saying goodbye to red forever! And I did use rose gold and blush here and there. Look at that cute baby–he fits right in with my Christmas decor! He’s kind of a giant these days. He’s only three months but wearing 9 month clothes. I played with the mantel a little before it got here. The greenery is the same fake garland that I used on the banister and I’m just so happy with how realistic it looks! I want so bad to say I can only do real greenery, but it is just SO dang messy and high maintenance! Maybe I’ll try it again when I don’t have babies keeping me so busy. 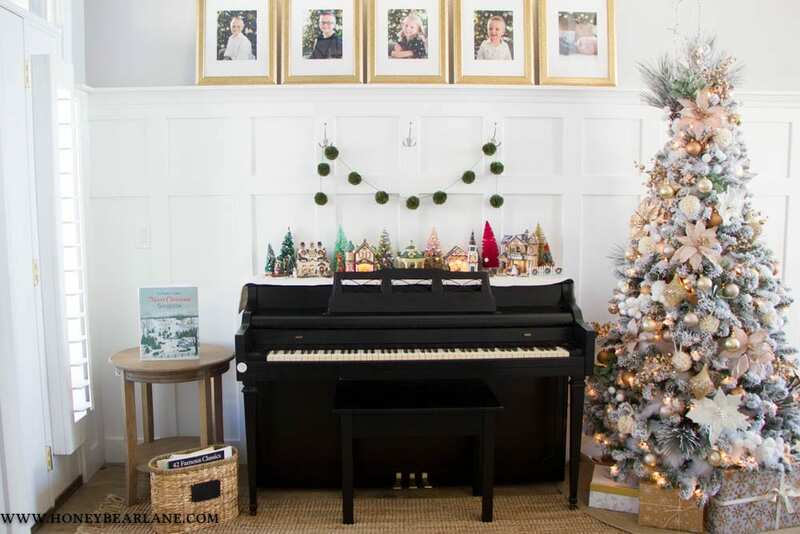 The little black and white Christmas tree in front of the fireplace is a Christmas advent calendar I made several years ago and the kids absolutely love taking turns flipping each day over. 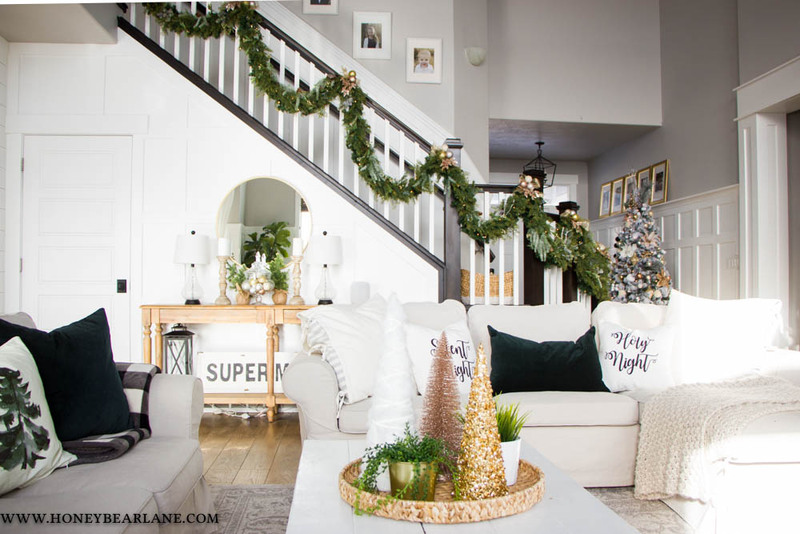 I had so much fun decorating my house and getting to share it with all of you! A lot of these items or other decor I love is available for purchase in my Amazon shop so give it a look! And of course, be sure to visit the next stop 12th + White! So much goodness! 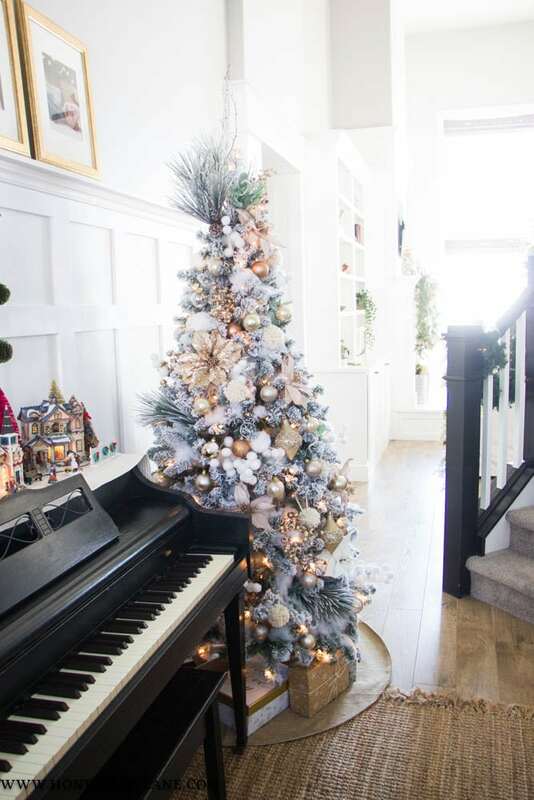 The tree, the wreath, your garland-so much inspiration! 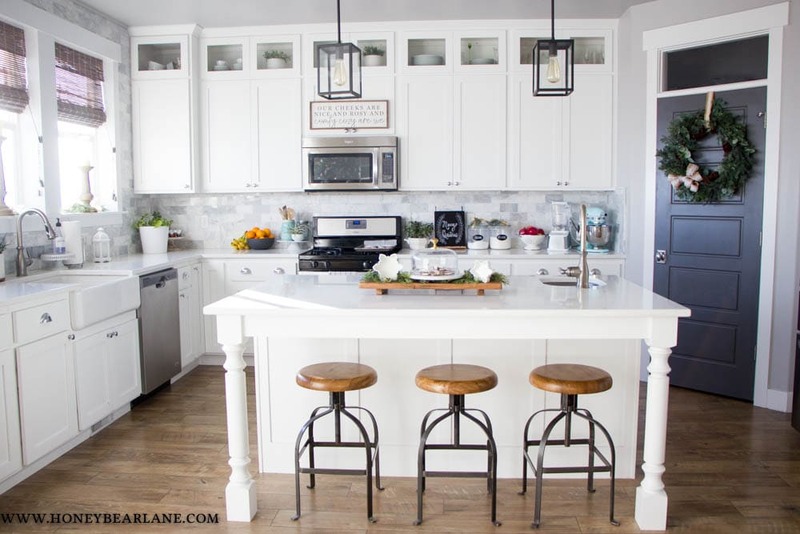 Such a gorgeous home tour! I love every last detail! 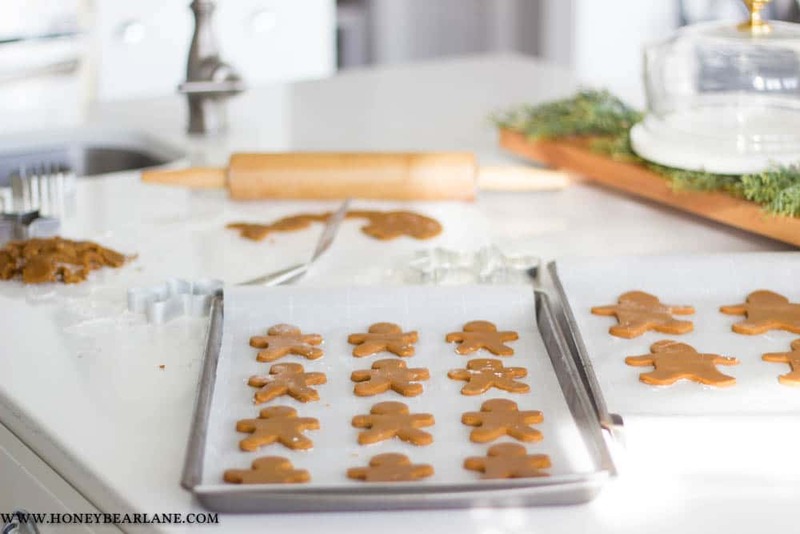 Oh, and now I need to get to work baking some gingerbread cookies! Happy Holidays!